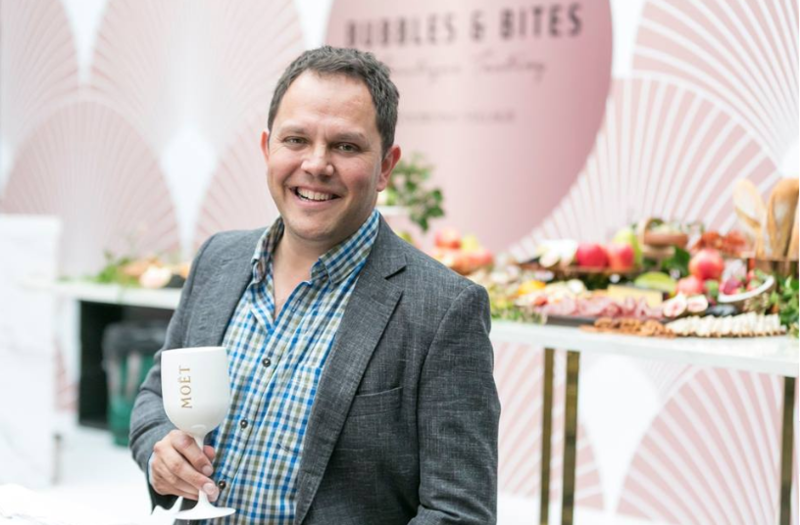 The weekend’s Bubbles and Bites event with chef Alastair McLeod inspired thoughts around local food sourcing, perfect food and champagne pairing, and creative solutions for entertaining as we enter this festive next quarter of the year. Guests arrived to a stunning scene at Toowong Village, picking up a glass of bubbles on arrival and taking in the stunning orchid, lilly and rose floral arrangements by Daisy’s Florist Toowong. The day was all about easy entertaining, and an oversized grazing platter was the centrepiece to the party. Cheese, charcuterie, nuts and olives, dark chocolate, some sweet fruits, relishes and jams along with beautiful artisanal breads came together in a colourful display that’s easy and practical for spring and summer get-togethers. Fresh food was sourced from Bakers Delight, Fruity Capers and Deli, and Health Squared, with beverages (we’ll get to that) from Vintage Cellars. “I always strongly advocate shopping in your own backyard. There’s been a disconnect with food and I think what’s happening with the fresh food provodores here at Toowong Village is that reconnection and that really resonates with me,” said chef Alistair McLeod, who kept the audience entertained through cooking and wine tasting. Ok to the wine list. 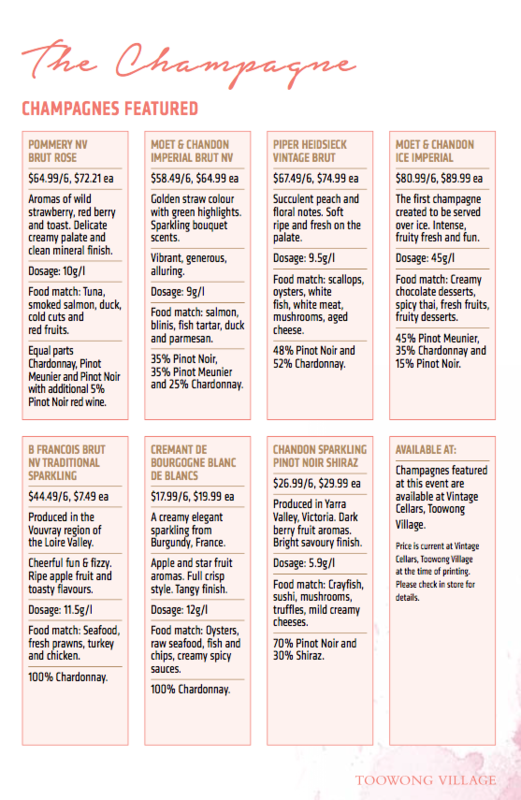 Seven different bubbles (some champagne, some sparkling wines) were featured (full details below). Guests were asked to guess which of the two glasses served first was the Moet & Chandon Imperial Brut NV, to which most selected correctly. Suggestions for food pairing included salmon blinis, fish tartar or duck and parmesan. As the afternoon unfolded, other favourites included the Piper Heidsieck Vintage Brut, and a special Moet & Chandon Ice Imperial, served over ice with fruit and best matched with creamy chocolate desserts, spicy thai and fresh fruits. More tips and tastings were served, including some delicious canapes (creamy brie topped with fresh honeycomb was a favourite), and guests were quizzed on their new-found knowledge before the afternoon drew to a close. The rule with cheese is to buy a little, often. A good rule of thumb is 50g per person of cheese, even less if your grazing table includes charcuterie and dips. A mix of charcuterie, cheese and dips ticks off a lot of dietary requirements. Rice crackers are a good idea to have on hand for gluten free guests. If you have any left overs, cheese is best wrapped in tin foil rather than cling wrap as it allows it to breathe. To see all the images from the day visit Toowong Village’s Facebook page.